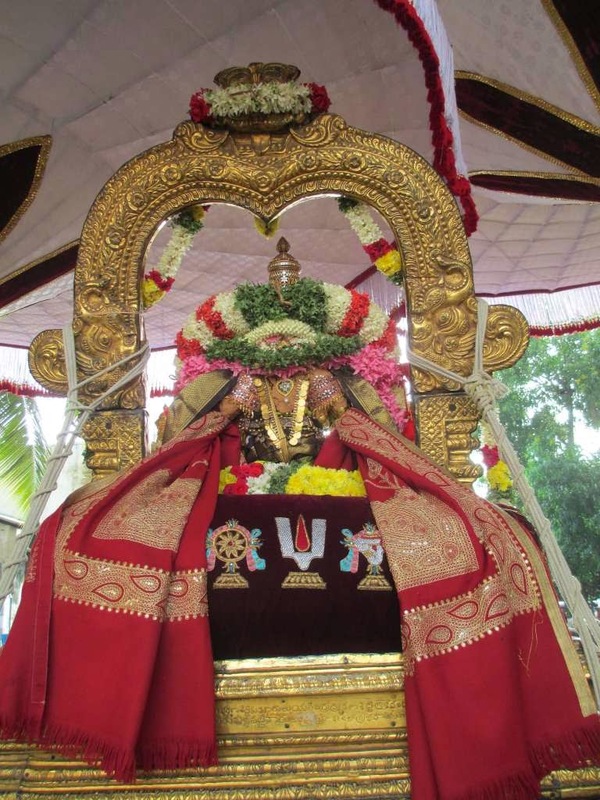 The annual Utsavam of our Greatest Acharyar which was celebrated for the past 10 days, concluded today, being ‘Thirumoola Nakshathiram’ in the month of Aippasi – the birth star of Swami Manavala Mamunigal. 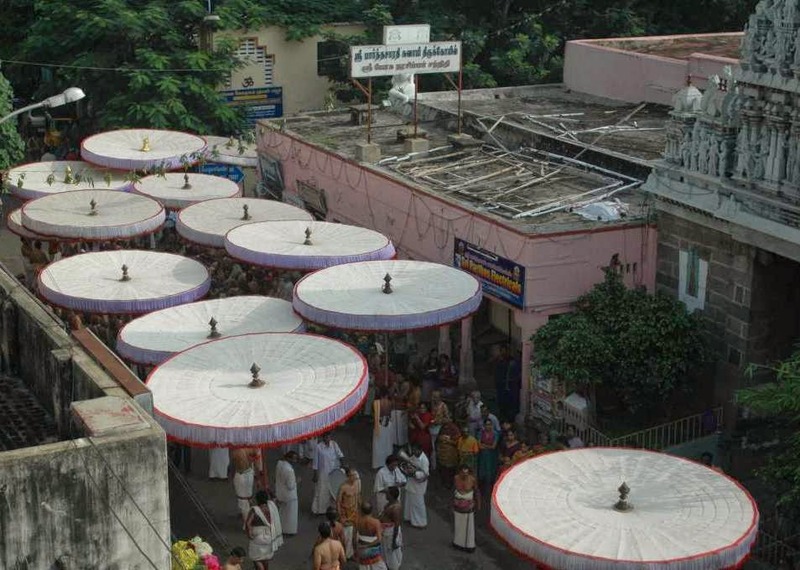 At Thiruvallikkeni divyadesam, after the grand purappadu in the morning of Sri Manavala Mamunigal with Sri Parthasarathi, garnished by 10 pairs of divine umbrellas – there was the grand purappadu in the evening of Acharyar Swami Manavala Mamunigal with Lord Parthasarathi. 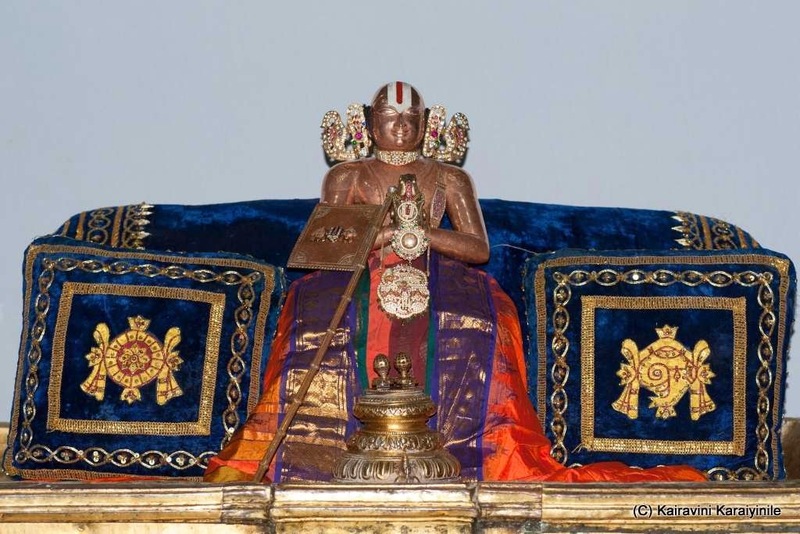 In the morning goshti, it was Upadesa Rathinamalai and now in the evening, it was ‘Ramanuja Noorranthathi’. 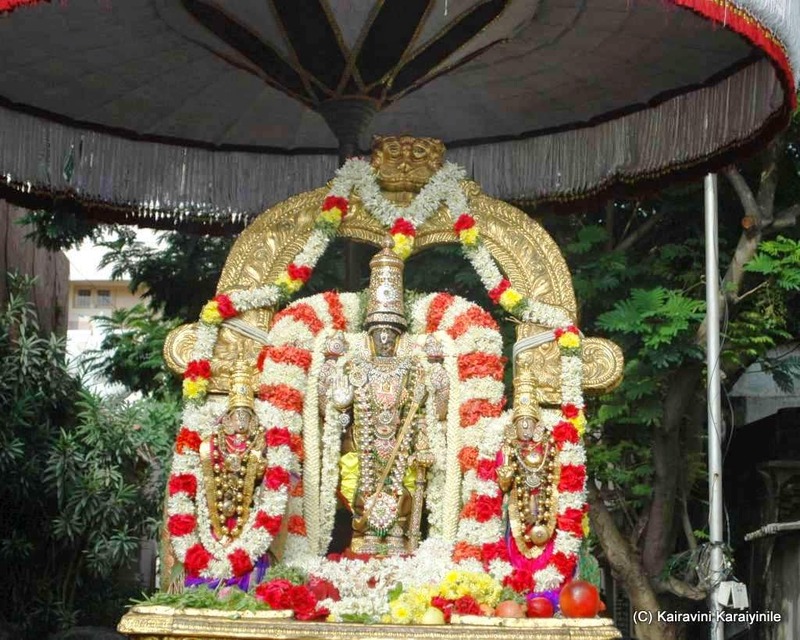 No need to wonder- for today, 27th Oct 2014 is a great day for all Sri Vaishnavaites. 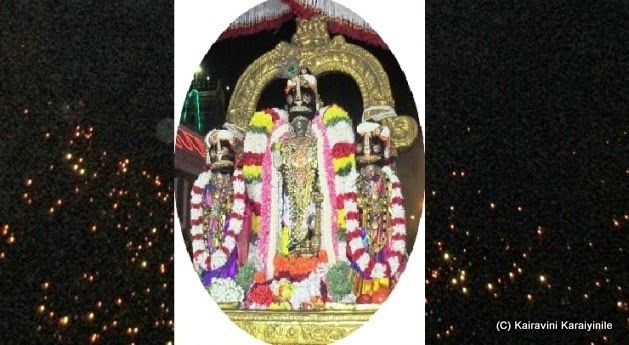 The annual Utsavam of our Greatest Acharyar which was celebrated for the past 10 days, concludes today, being ‘Thirumoola Nakshathiram’ in the month of Aippasi – the birth star of Swami Manavala Mamunigal. 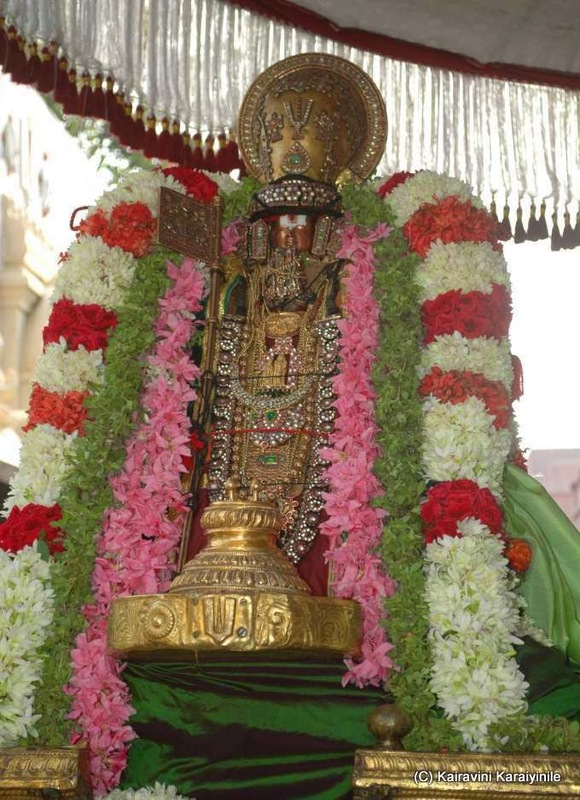 Mamunigal is known as ‘Yathindra Pravanar’ arising out of his irresistible attachment to the lotus feet of Sri Ramanujar known as ‘Yatheendrar’. 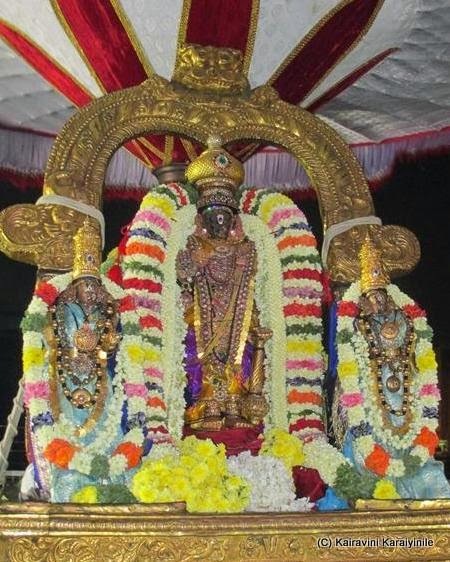 Sri Manavala Mamunigal is the incarnation of Adisesha. He was born in Alwar Thirunagari, Tamilnadu in AD 1370. 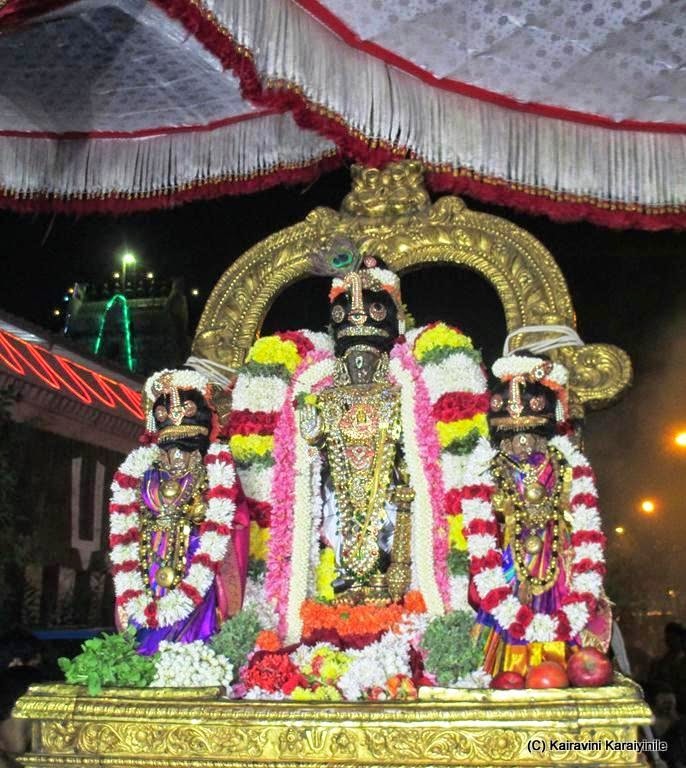 At birth he was known as ‘Azhagiya Manavala Perumal Nayanaar’. 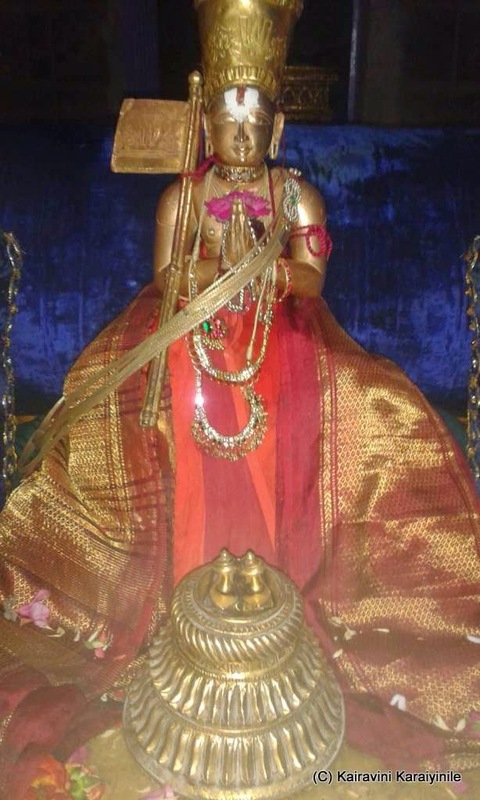 Later he was hailed in very many names such as ‘Yatheendra Pravanar’, Ramyajamathru, Saumyajamatru, Visada-Vak-Sikhamani , Varayogi, Varavaramuni and more…..
His parents were Thigazhakidanthan Thirunaveerudayapiran Thatharannan, a disciple of Sri Pillailokacarya, and Sriranga nachiyar.. 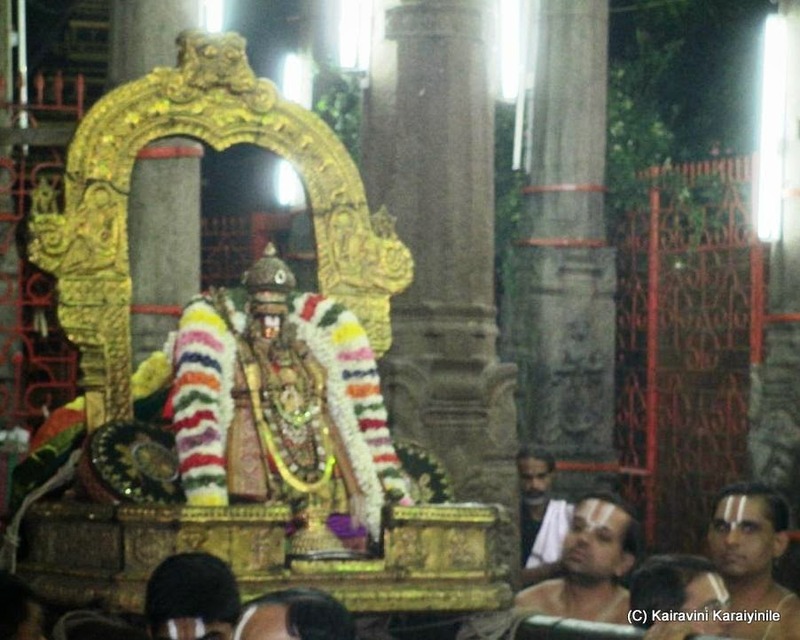 He became a sishya of Tiruvaimozhip pillai. 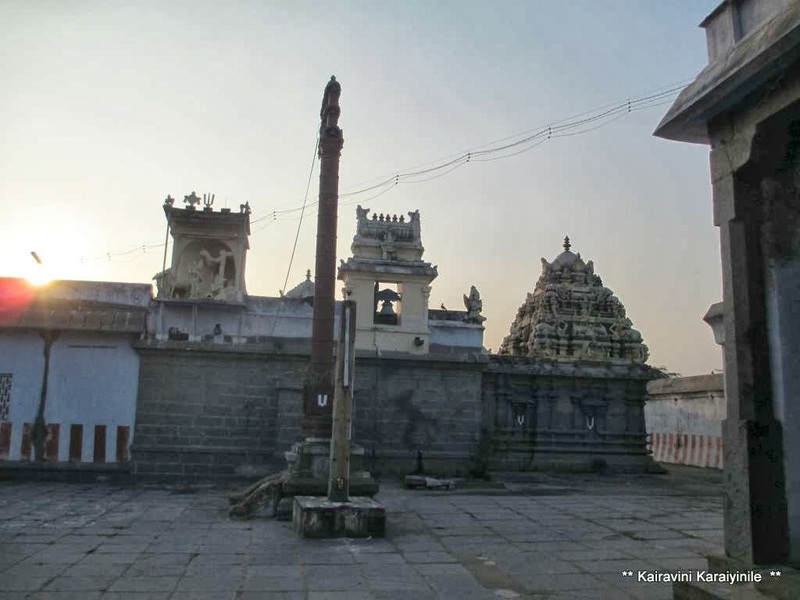 Manavala mamuni's devotion to Nammalvar, Ramanuja and to his own Acharya grew as he studied the Alwar's hymns and rahasyas at Alvar Thirunagari. 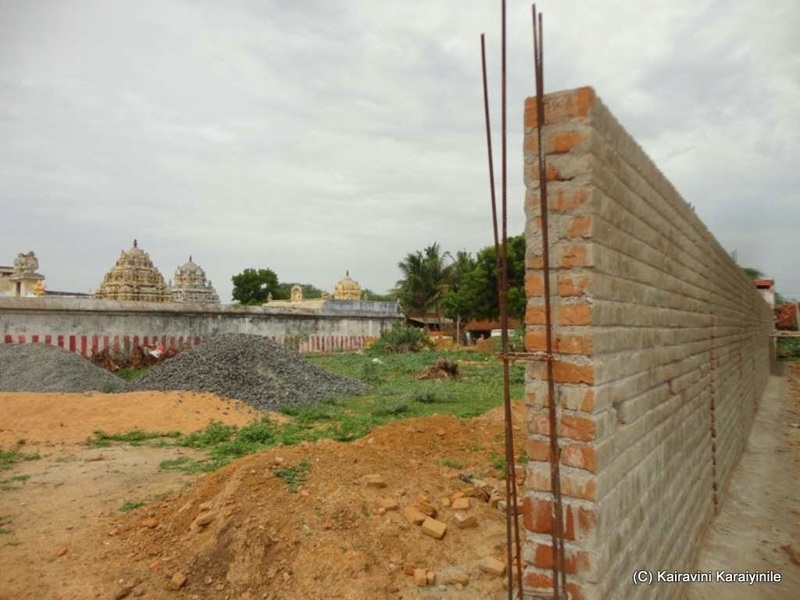 He lived for 73 years on this earth performing many Kainkaryams at Sri Rangam and undertook many pilgrimages to many Sri Vaishnava Divyadesams spreading knowledge and bakthi culture. His patent style was to elucidate the pramanams fully ‘following the words of the Purvarcharyas without deviating a wee bit’. He filled his vyakhyana granthas with the words of purvAcharyas. 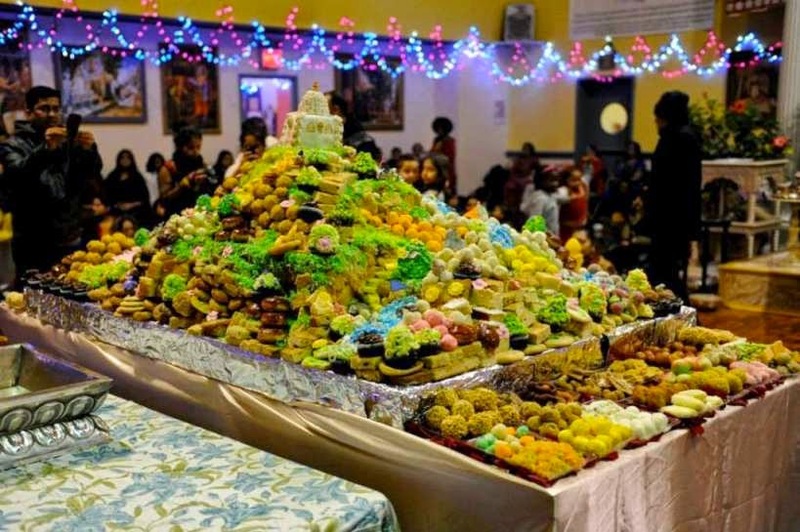 As followers of Mamunigals, duty thus is cast on us to understand the significance of preserving, maintaining, supporting and following the rituals and customs associated with all our traditional Temples. Of the many works, ‘Upadesa Rathinamalai’ is one which all of us should know and recite regularly. 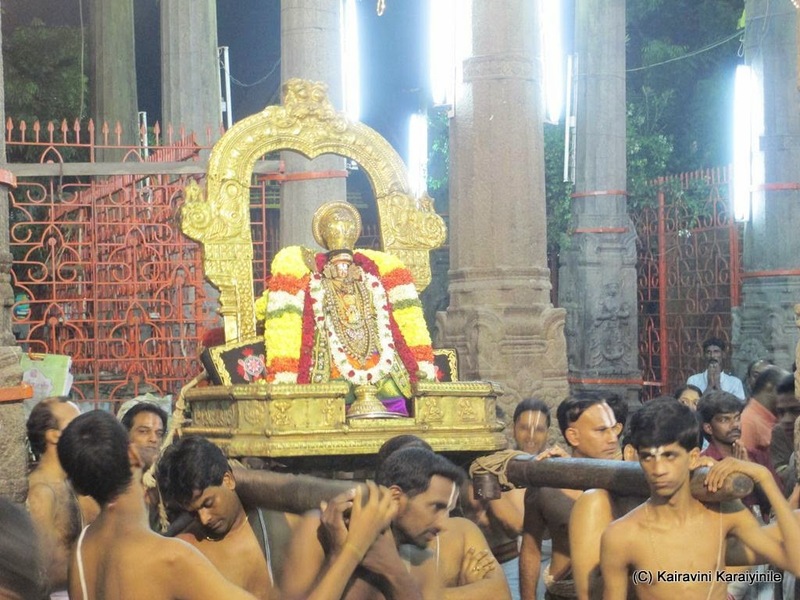 There are 73 paasurams + thanian given by Kovil Kandadai annan and another one rendered by Erumbiappa. 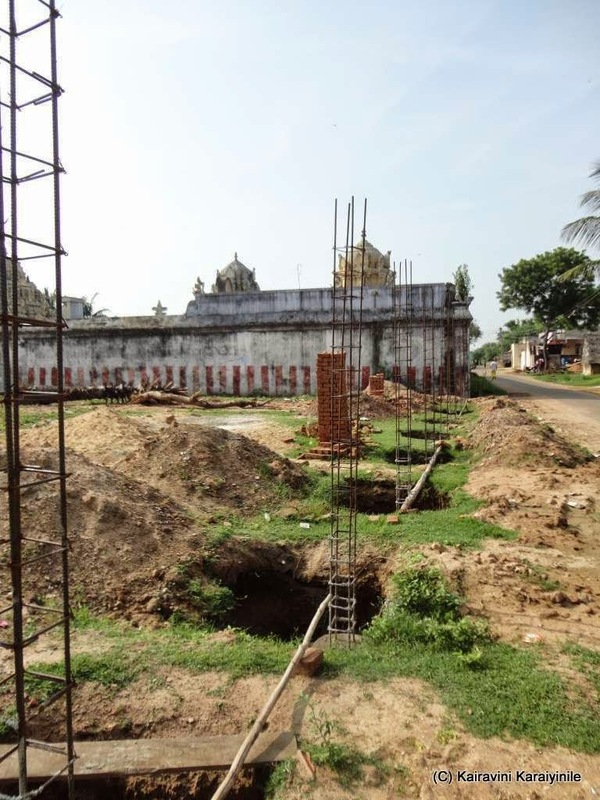 In the introductory remarks, Swami Maamunigal declares that he is performing upadesam for the future generations in strict accordance with the upadesam that he himself received from his Achaaryan, Thiruvaaimozhip piLLai and his AchArya paramparai. 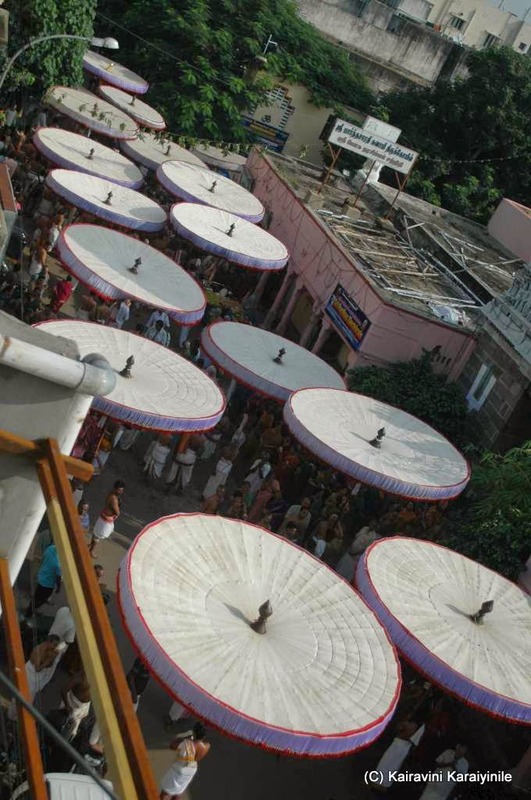 to celebrate the vaibhavams and commentaries of those imbued in Bakthi, the Azhwargal and those reverred Purvacharyas and always hold them in highest esteem – he says it is his bounded duty to talk of those commentaries to all those people in seven Worlds for their spiritual upliftment. 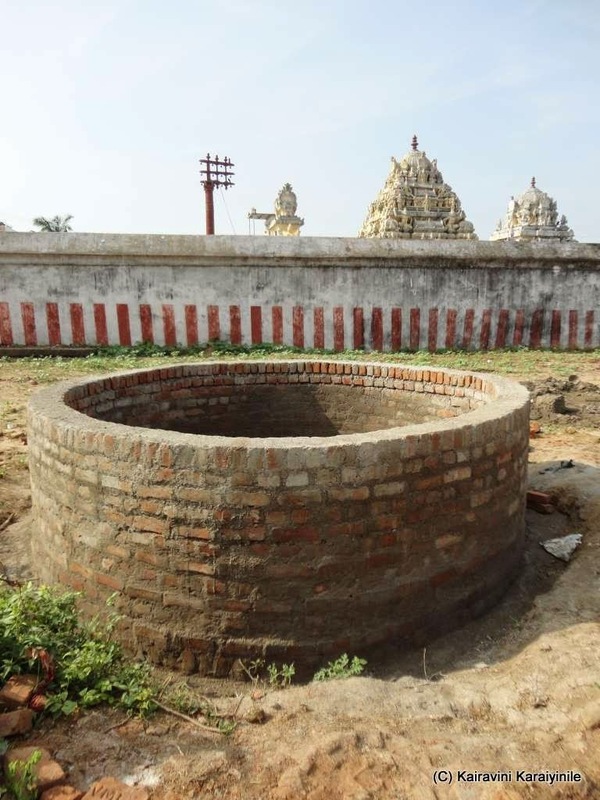 The ideology and purpose of a Srivaishnavaite is to do kainkaryam to the Bhagwan (Emperuman) and Bhagawathas. We are born to serve our Master – the Lord and the best way of reaching Him is through our Acharyas who have very clearly shown us the path. Sri Manavala Mamunigal, is the most reverred matchless Acharyar of our Srivaishnavaite philosophy, practised by Thennacharya Srivaishnavas. 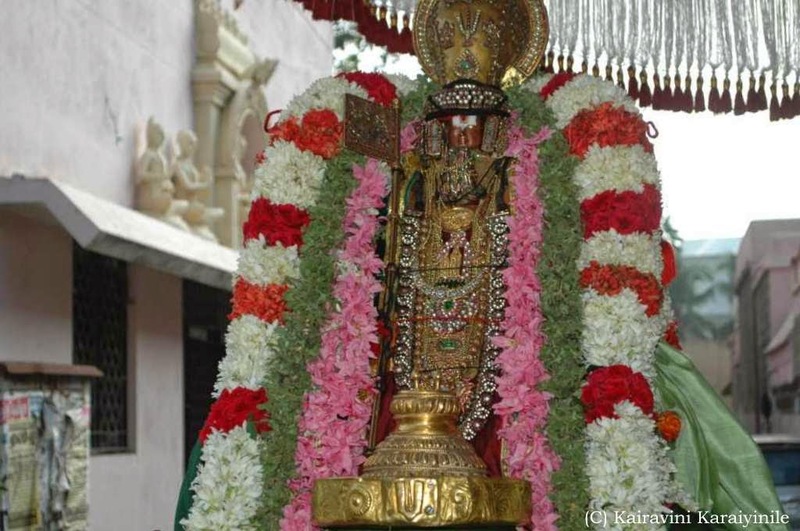 Mamunigal the incarnation of Sri Adisesha, is known as ‘Yathindra Pravanar’ arising out of his irresistible attachment to the lotus feet of Sri Ramanujar known as ‘Yatheendrar’. 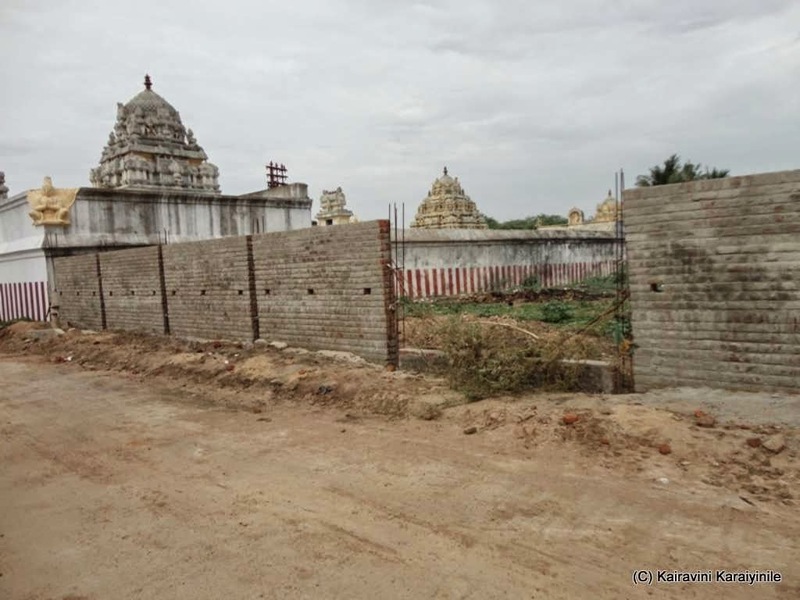 He lived for 73 years on this earth performing many Kainkaryams at Sri Rangam and undertook many pilgrimages to many Sri Vaishnava Divyadesams spreading knowledge and bakthi culture. His patent style was to elucidate the pramanams fully ‘following the words of the Purvarcharyas without deviating a wee bit’. 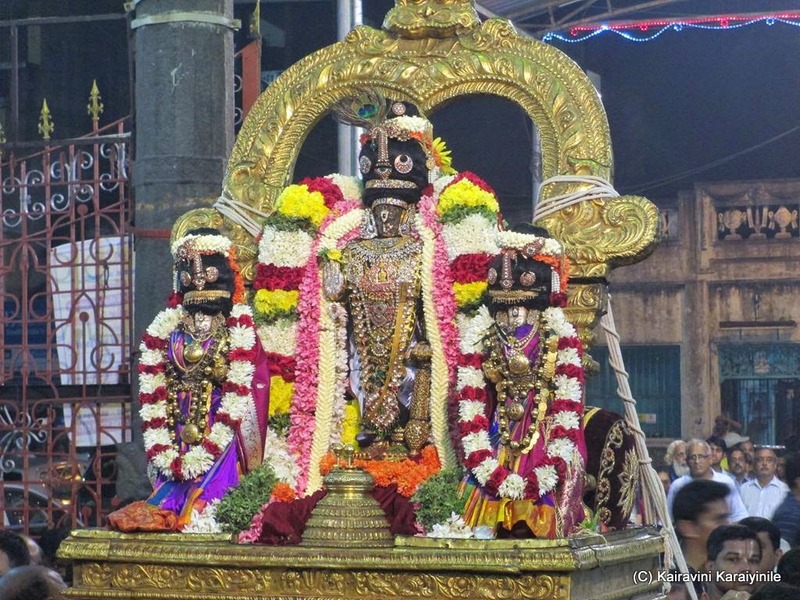 At Thiruvallikkeni and other divyadesams, 10 day Thiruvavathara Uthsavam of our Acharyar is being celebrated grandly and today 27th Oct 2014 is the ninth day of the Uthsavam. In the morning it was siriya Thiruther for our Acharyar and in the evening it was fragrant ‘Pushpa Pallakku’- the palanquin made up of flowers.’ Favourite memories are triggered by our sense of smell ~ flowers are admired for their beauty, exquisite shapes, spectrum of colours and more so for their fragrance. In our tradition, the decorative wreath of flowers woven together as garlands adorn God. Flowers have their pride of place and are mentioned in our epics – in Divyaprabandham too. 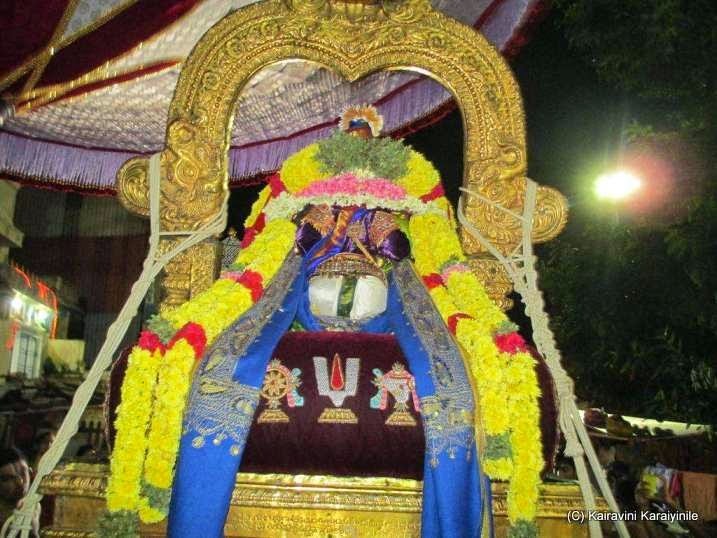 Here are some photos of our Acharyar in pushpa pallakku. 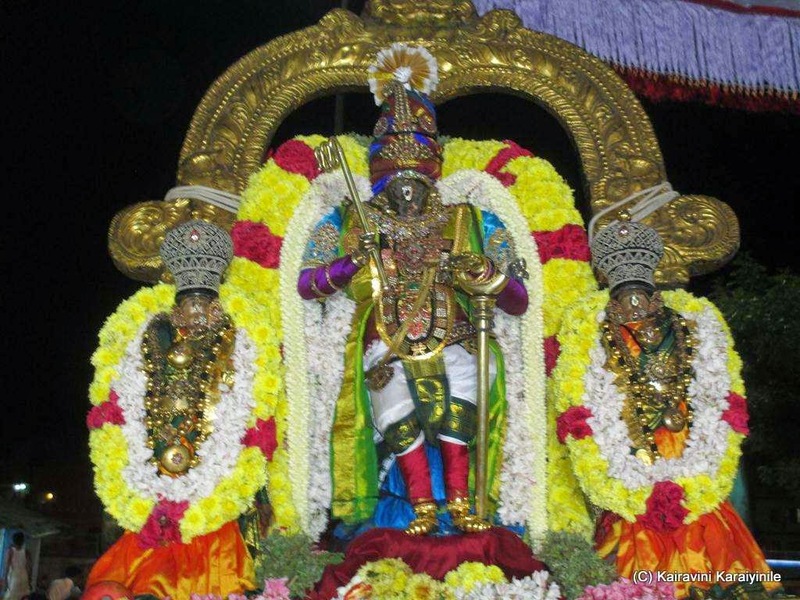 Lord Parthasarathi – what a dharshan – sublime beauty, draped in beautiful silk dress, dressed like a Cowherd King, wearing a turban, whip in his hand, the other hand resting, adorning many jewels, including impeccable shining ear rings ~ he was also wearing bangles - what a marvellous treat to His bakthas. We all go to temples and worship Lord in various forms. 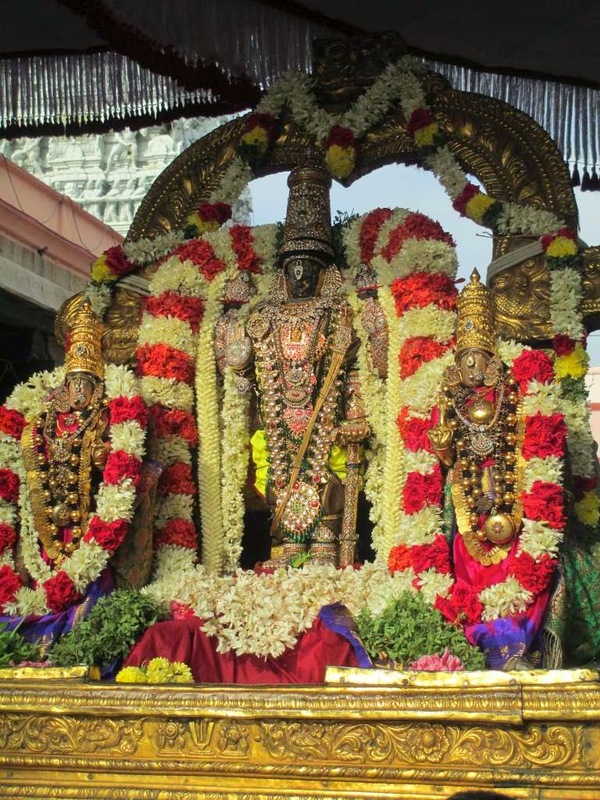 For us the Lord is Omnipresent and Idol symbolizes Him. Often we stand before the Lord and rekindle our worries beseeching his benevolence in getting remedy. There are others who visualize Him in various swaroopams and enjoy Him in their inner souls. 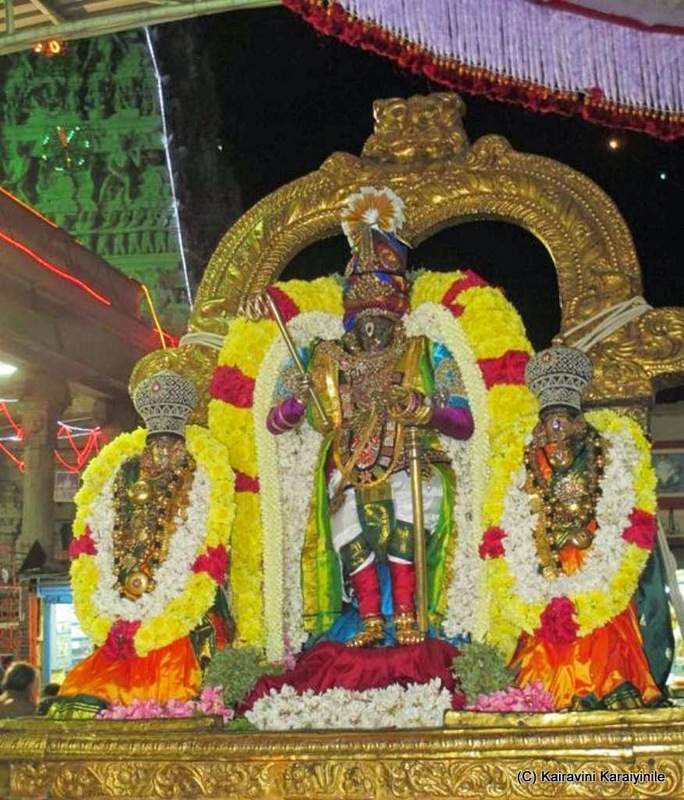 Saint Periyazhwaar, when he saw Lord Sriman Narayana astride Garuda, started thinking of His magnificence and started singing paeans seeking that no harm ever happen to the Greatest ! இன்று மணவாள மாமுனிகள் உத்சவம் அன்னக்கூட உத்சவம் என பிரசித்தி. இன்று பெருமாளுக்கு கதம்பம் முதலான அன்னங்கள் அமுது செய்விக்கப்படுகின்றன. 'இந்திரனுக்கு என்று ஆயர்கள் எடுத்த எழில் விழவில்' என 'கோவர்தனகிரி' பிரபாவம் நினைவு கூறப்படுவதாக கூறுகின்றனர். ஸ்ரீ பார்த்தசாரதி பெருமாள் 'ஆயர் குலத்தில்' வந்து உதித்தவராக கோல் (சாட்டை), தலைப்பாகை, தண்டம், என அணிந்து மிக அழகாக சேவை சாதித்தார். "சீலை குதம்பை ஒரு காது, ஒரு காது செந்நிற மேல் தோன்றிப் பூ" என கண்ணன் கன்றுகள் மேய்த்துவரக் கண்டு யசோதை மகிழ்ந்ததை பெரியாழ்வார் அனுபவித்த வண்ணம், ஸ்ரீ பார்த்தசாரதி தனது காதுகளில் 'ஓலை மற்றும் பூ' போன்ற திருவாபரணங்களை அணிந்து கொண்டு அழகான பட்டு உடுத்தி, கைகளில் வளைகள் அணிந்து சேவை சாதித்தது நம் போன்றோர்க்கு கிடைத்தற்கரியது. Deepavali ‘the festival of lights’ is always enchanting – an occasion to wear new clothes, eat sweets, burst crackers, be with friends and relatives – a festivity which brings enjoyment…. 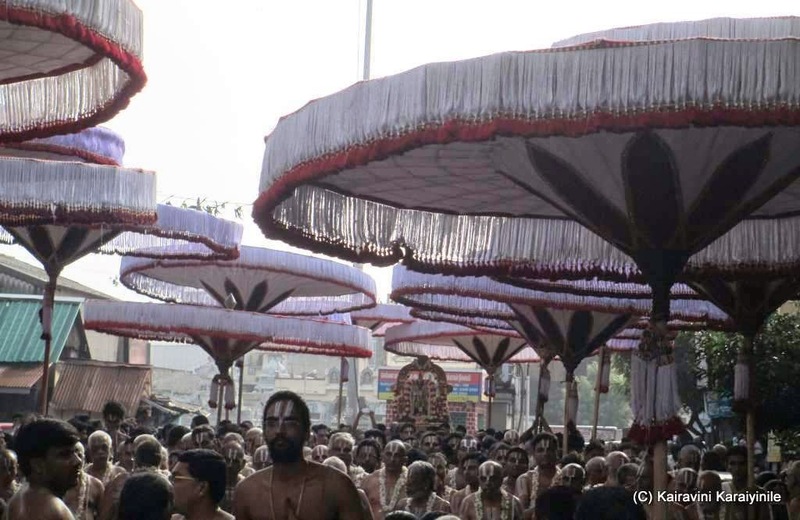 – the festival was grandly celebrated all over the country. In the recent years, there has been some attempt to wean away people as some keep saying that ‘enthusiasm towards fireworks is going down; spiralling prices have forced people to buy less of firecrackers; the pollution awareness is swaying public away from crackers and the like……….’. In today’s context, at some places, people get glued to the cinemas and other special programmes the multitudes of TV channels present…. 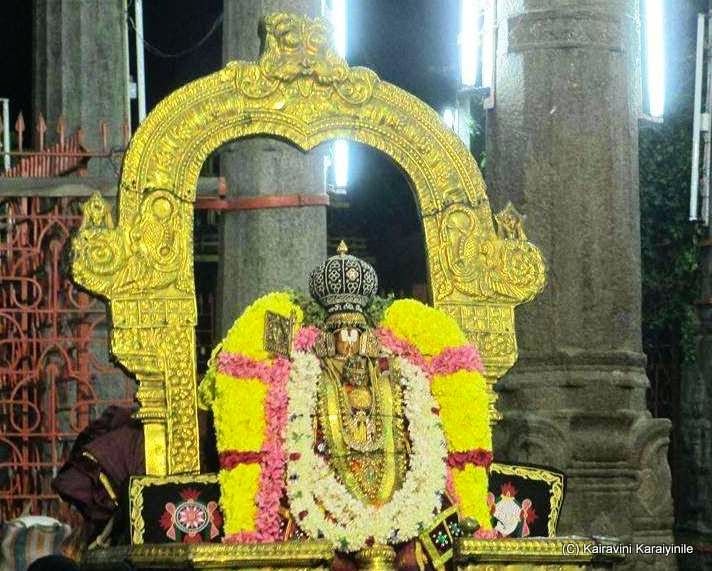 Thiruvallikkeni, the abode of Lord Venkata Krishnan is different – it boasts of the Temple sung by 3 Azhwars ~ innumerable days of festivals; crowds thronging to have darshan of Lord Parthasarathi inside the Temple, and more gathering to have His darshan during the ‘thiruveethi purappadus’. Every year, Deepavali coincides with the 10day uthsavam of Swami Manavalamamunigal, the Great ACharyar of Srivaishnavism, the Acharyar propogated Thennacharya Sampradhayam. 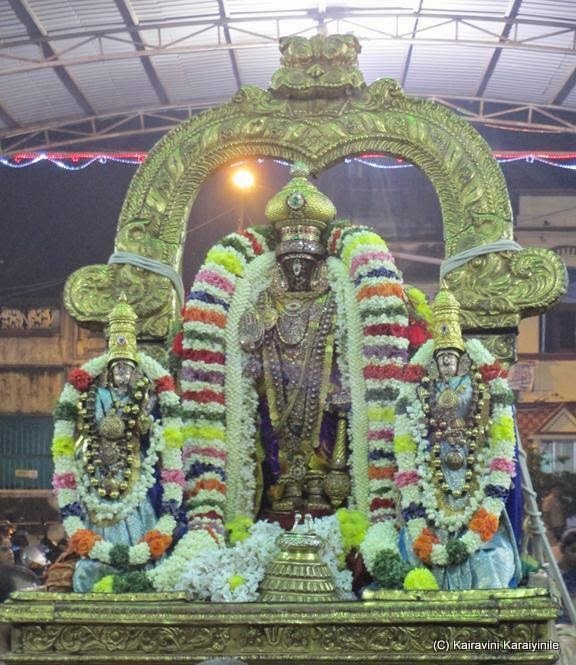 Generally it would be 4th or 5th day of the Uthsavam and this year it was day 4th day of Sri Manavala Mamunigal Uthsavam. 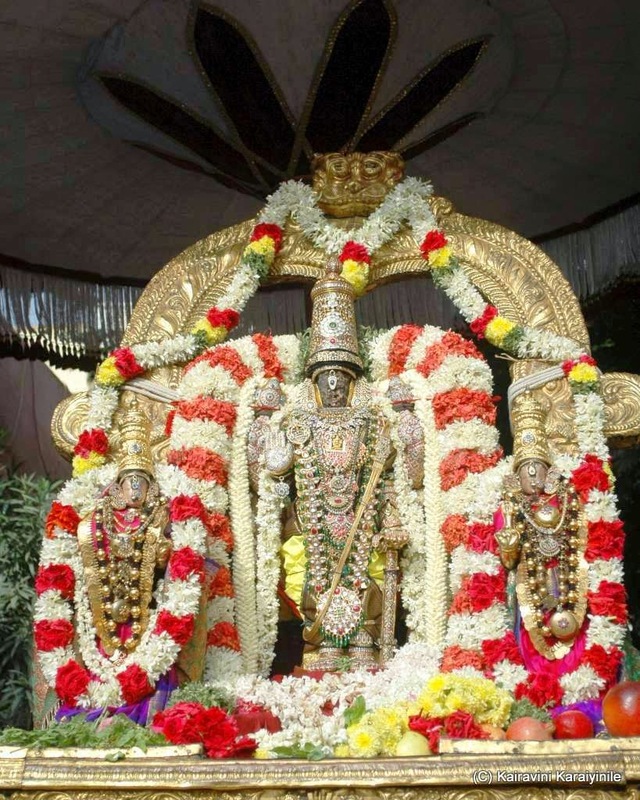 On this day, Triplicanites eagerly look forward to the evening purappadu of Num Acharyar with Sri Parthasarathi. 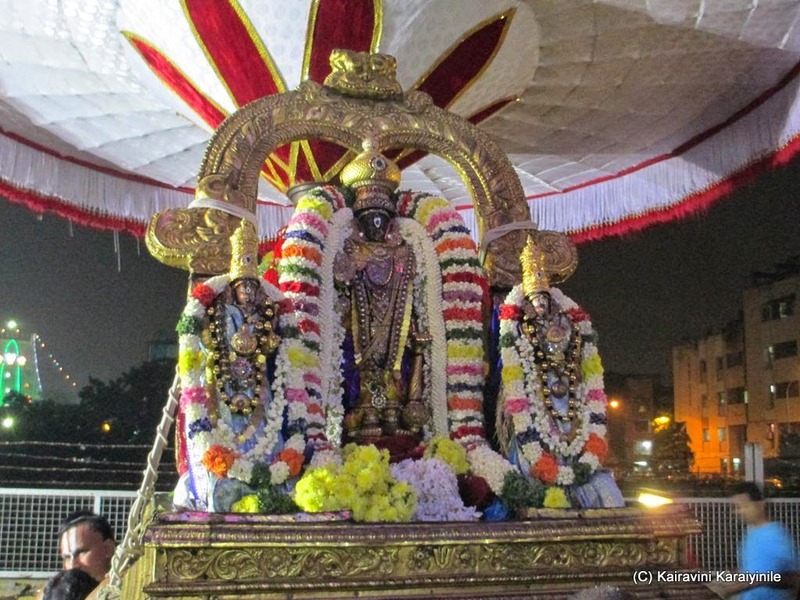 On 22nd Oct 2014, due to a mishap in vicinity, the Thirumanjanam and goshti (Perumal Thirumozhi of Sri Kulasekara Azhwar) had to be delayed – yet the grand purappadu started at around 07.15 pm. 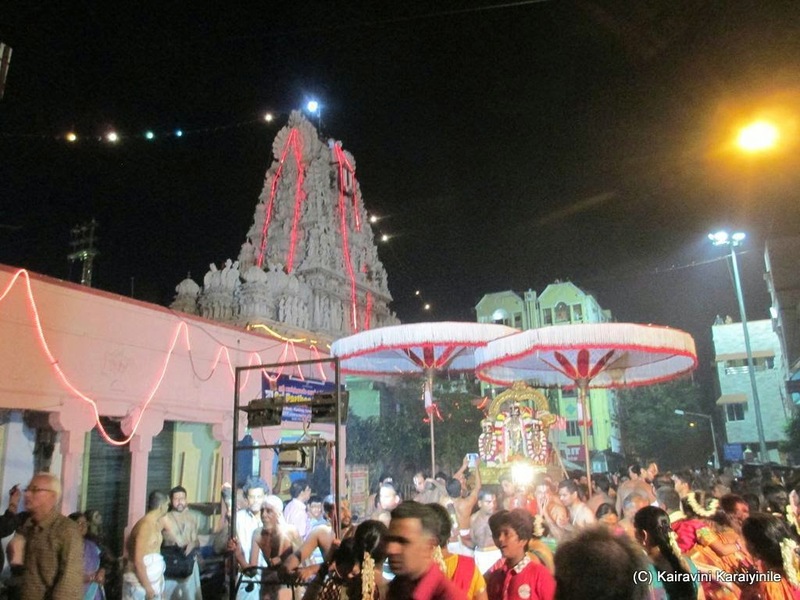 Thousands of devotees witnessed Sri Parthasarathi Swami beaming His resplendent splendor. 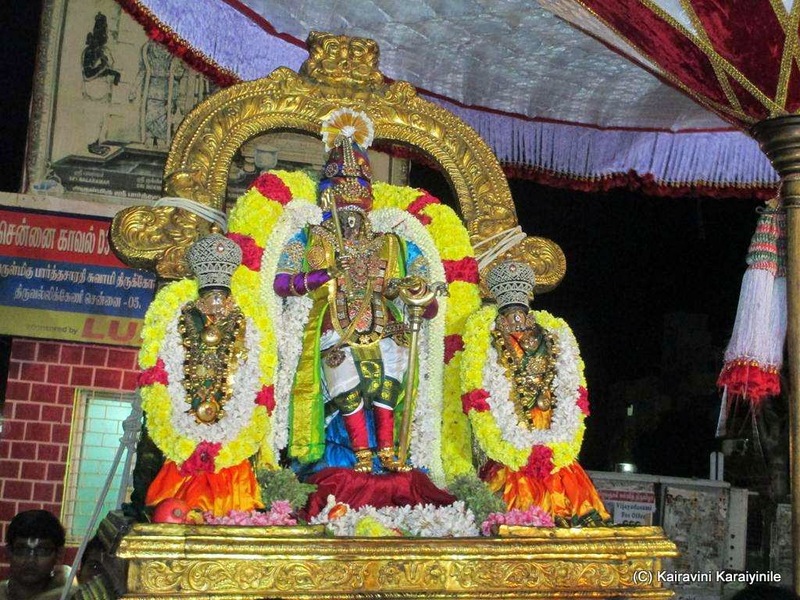 If you enjoy Sri Parthasarathi with simple decoration having a single garland – you relish Him fully – again, when you see Him ornate with most beautiful choicest jewels, He outshines all the jewels that adorn him. For Deepavali, He was embellished with many jewels shining beautifully in the lighting provided by fireworks. 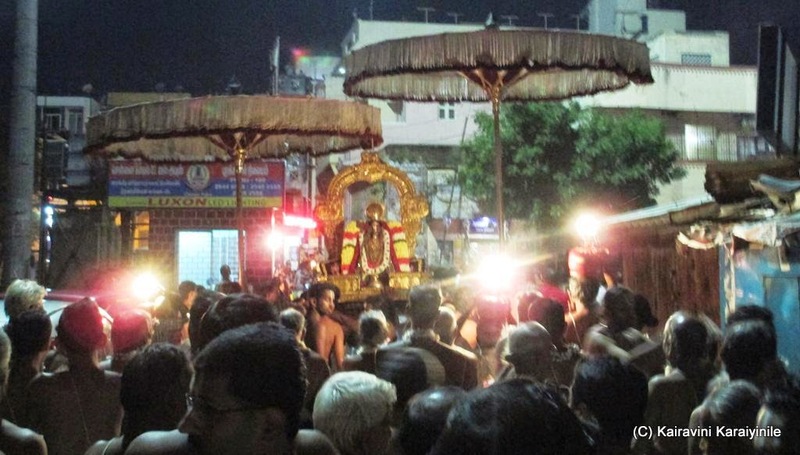 The expectant bakthas took the opportunity of greeting Him with ‘scores of 10000 wallahs, the sky was lit with latest fireworks’ – all providing entertainment for the thousands who accompanied the Lord in His purappadu ….. as residents of Thirvallikkeni celebrated Deepavali and bustled with one another to have a glimpse of His darshan. 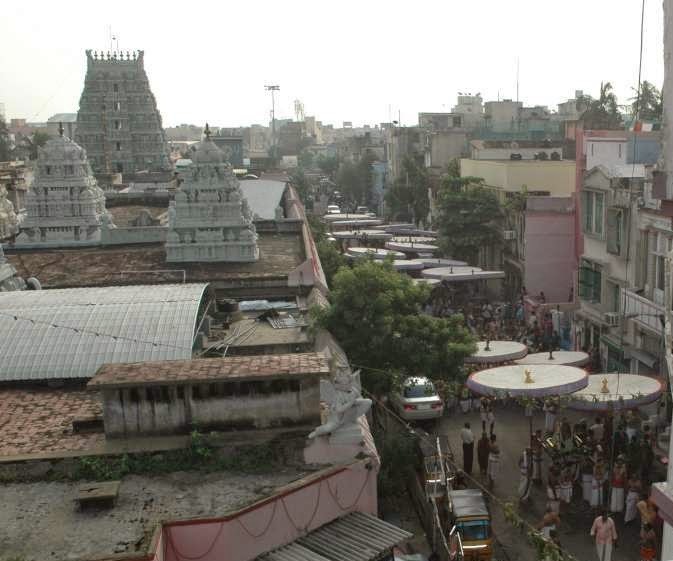 At TP Koil Street, rain interrupted and Sri Parthasarathi Swami and Acharyar Manavala Mamunigal returned to the temple. 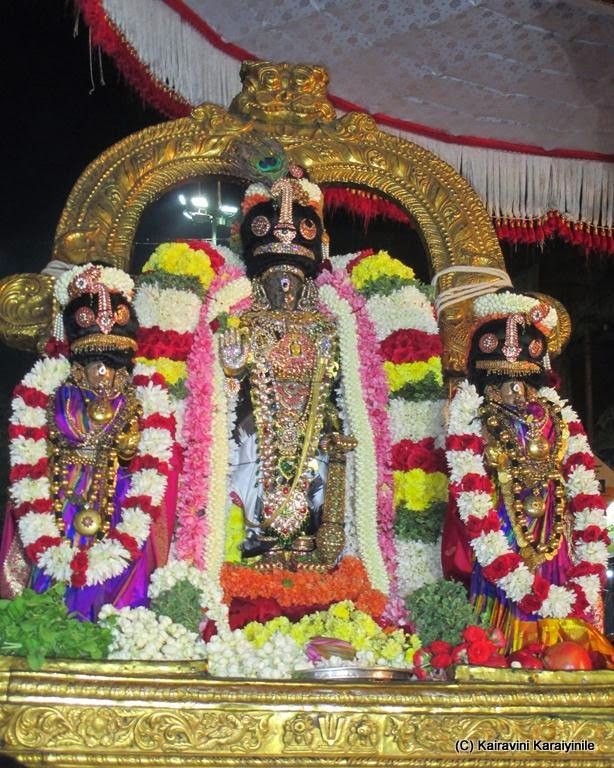 No worry for His Bakthas, there are so many purappadus in Triplicane and today (23.10.14) being Amavasai, there will be purappadu of our Acharyar accompanied by Sri Parthasarathi.